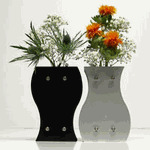 These 2 bud vases can be used separately, but together they make an even more intriguing combination. Each completes the other to make a perfect set! Both are crafted from 4-1/2” high aluminum, one is black anodized and the other clear anodized for a durable finish. The Night and Day Bud Vases make an original wedding, anniversary, or housewarming gift. Customer Responses for our unique "Night and Day Bud Vases"